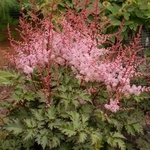 Astilbe 'Delft Lace'. This newer astilbe was discovered as a seedling of unknown origin. 'Delft Lace' has deep blue-green, waxy foliage that is covered with a silver-lacey overlay. A sunnier location will develop a red blush on the leaves. Red stems carry panicles of deep salmon red buds which open to soft apricot pink flowers in early summer. Deep red seed panicles extend the season of interest through summer. PP#19839.